(Leah Hogsten | The Salt Lake Tribune) Jacob Alexander Turner wheels all of his belongings in a shopping cart, Thursday, December 3, 2018 from where he was camped along 500 South. Turner said the shelter was dangerous and nasty and that "you can't hold on to anything there" because of theft. "Here we look out for each other and help each other," said Turner of the 500 South block of homeless tents. The Leonardo museum says a block-long homeless camp along 500 South in Salt Lake City is a safety concern for its patrons and as a result, Salt Lake City Police Department officers told more than 30 people camped in tents that they had to pack up their belongings and leave. The Leonardo museum says a block-long homeless camp along 500 South in Salt Lake City is a safety concern for its patrons, but those asked to move say they have nowhere else to go. Peterson said museum staff clean up outside the building and has dealt with property damage. Two men who were fighting broke through a window the museum has yet to have repaired due to its $10,000 cost, she said. 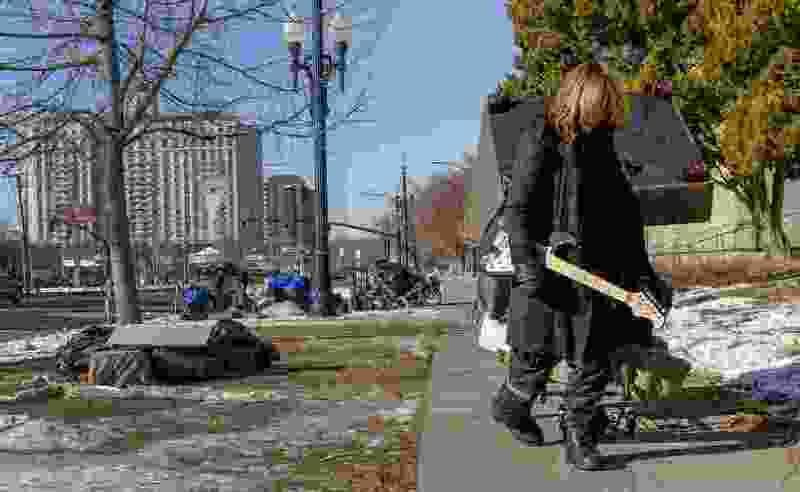 While the Salt Lake County Health Department did clean up the area in December, Executive Director Gary Edwards said that sleeping bags and tents were not removed because of the time of year. “We can’t in good conscience take those types of belongings from individuals," Edwards told FOX 13. FOX 13 spoke with people experiencing homeless who were sleeping near the museum Thursday. Many said they don’t have anywhere else to go. Some of those who moved just set up camp around the corner from the museum. See more at FOX 13. Editor’s note: The Salt Lake Tribune and FOX 13 are content-sharing partners. Should felons vote? 2020 Democrats can’t decide.